Amazing Animal! 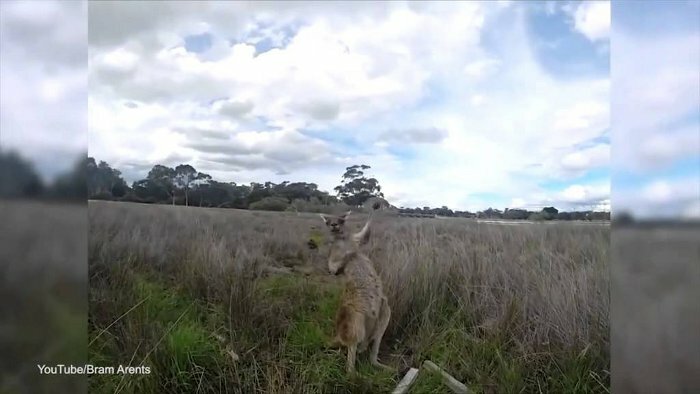 Kangaroo Shows Off Awesome Air Guitar Skills - 2NGAW! You surely will not believe your eyes when you see this one. A kangaroo from the Land Down Under has been attracting a lot of online attention as of late when its video suddenly went viral on social media. The heavily-shared footage features the adorable animal which seems to be performing an imaginary guitar – much to the delight and amazement of the spectators. Mirror reports that the scene was caught on camera by one of the audiences at the Heirrisson Island located in Perth, Australia. The animal remained completely unmindful as it performed an on the spot rock gig to everyone present – and somehow making history along the way as the first kangaroo rockstar. If you play the YouTube clip below, you will see that the kangaroo really knows how to rock it out. It stretches a single hand up in the air while doing some strumming with the other. On top of that, the animal seems to be demonstrating its axe-playing expertise by being a bit adventurous and trying out different angles as well. The kangaroo seems to be ready to give air guitar players a run for their money. A guitar track was appropriately added to enhance the footage and make it more fun. As you can probably imagine, the end result is both impressive and extremely amusing. Of course, a few online haters were quick to point out that the animal was merely scratching itself. They are probably right but that explanation makes things boring. We’re sure these skeptics are no fun to hang around with during parties. And that they are likely living lonely and dull lives! Anyway, here’s the video entitled “Rock n Roo! Watch a kangaroo bust out air guitar moves.” Enjoy viewing and feel free to share this with your social media buddies.